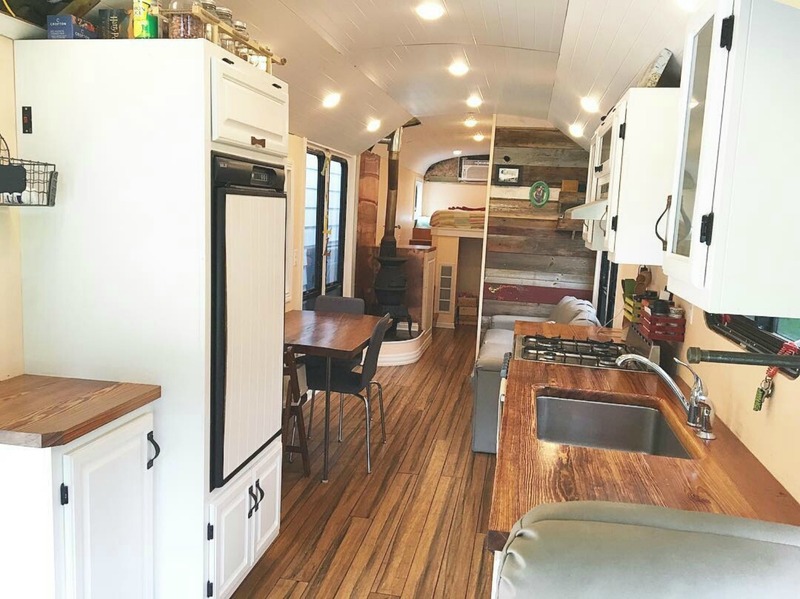 Converting an old school bus into a livable home is no easy task, but with a little ingenuity, amazing spaces can be created. 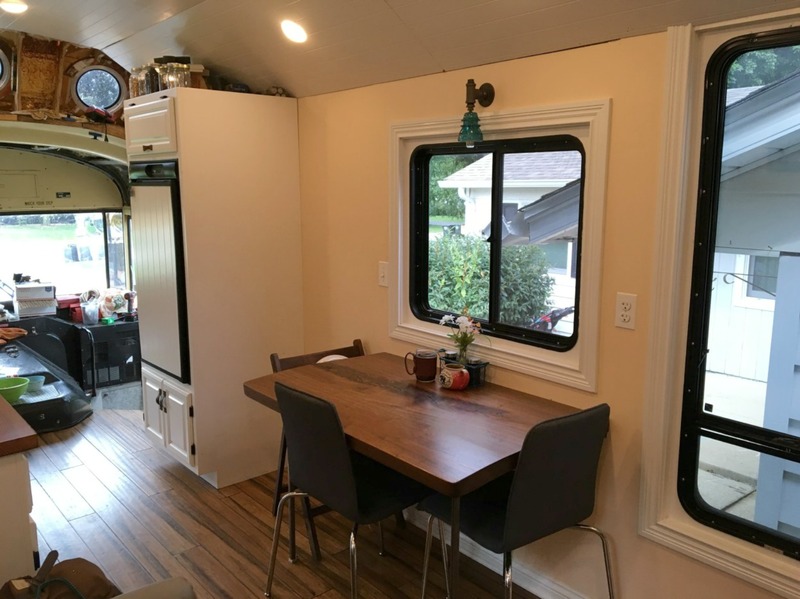 When Luke and Rachel Davis of Midwest Wanderers decided to travel full time with their daughter and dog, they renovated a 240-square-foot school bus into a surprisingly spacious off-grid home that includes a raised roof, solar panels, and a beautiful interior design. After deciding to leave their Chicago home behind and take the leap into nomadic living, the couple purchased an old school bus for $4,000. They gutted the entire structure and began to do the bus renovations themselves using as many repurposed materials as possible. 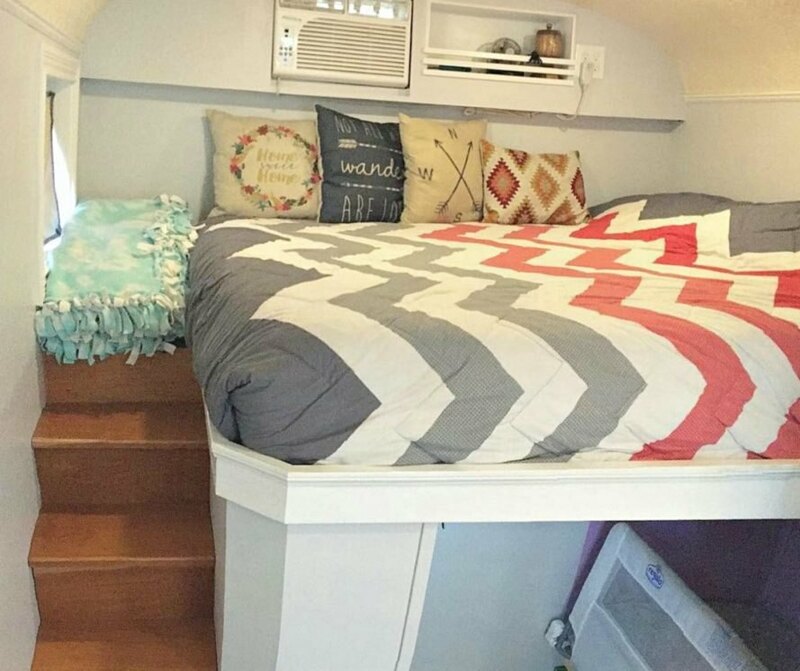 A year and a half later, the couple raised the bus’s roof by 24 inches to add height to the living space. The extra space does wonders for the living area, which is illuminated with an abundance of natural light thanks to the porthole skylights on the raised ceiling. The sophisticated interior design is extremely comfortable for the family of three, plus their dog, Baxter. The living room, kitchen, bathroom, and two bedrooms are all equipped with strategic storage solutions to help reduce clutter. Thanks to the elevated roof, the couple was able to add a sleeping loft on the upper level that is accessible via ladder. A second bedroom for their daughter is located just underneath on the main floor. The living area also has a sleeper sofa with plenty of storage underneath. Adjacent to the sofa is a dining table that can be folded down when not in use. A cast iron pot belly wood stove sits in the corner of the living space, and provides enough heat to warm the interior. In the corner of the living space is a compact bathroom, which was installed with a composting toilet and a RV-style tub shower. As a former baker, Rachel was determined to have a working kitchen with sufficient space. Accordingly, the kitchen was equipped with a large countertop, a four-burner stove, and a refrigerator. The handy duo wanted to make their new home as self-sufficient as possible. They used as many repurposed materials in the conversion process as possible, installing upcycled bamboo flooring, reclaimed barn beam countertops, a reclaimed barn wood accent wall, and a locally-reclaimed walnut table. For energy use, a 900-watt solar array provides all of the family’s energy and their water use is reduced thanks to a composting toilet and a low-flow shower head in the bathroom. You can follow the adventures of the Midwest Wanderers on their blog and Instagram page. The living room, kitchen, bathroom, and two bedrooms were all equipped with strategic storage solutions to help reduce clutter. Ample light floods the interior of the bus. 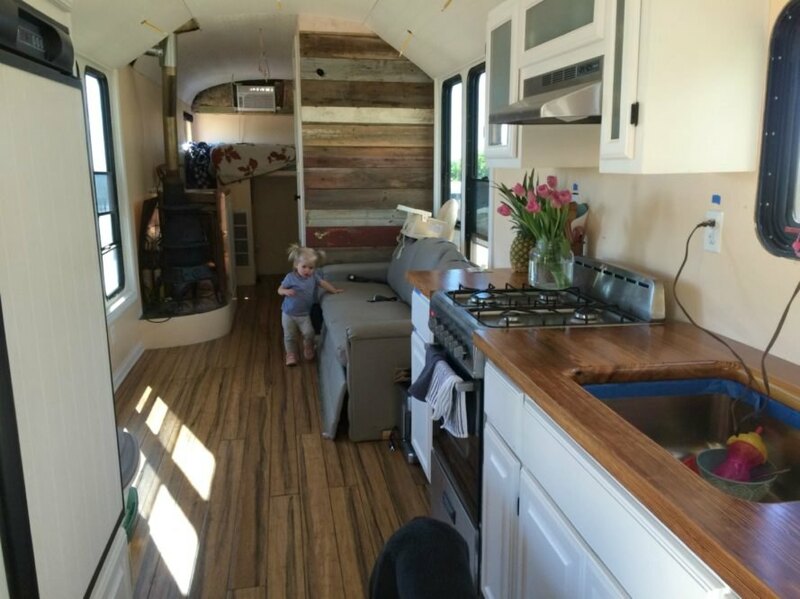 The traveling duo converted the bus into a roaming home on wheels. 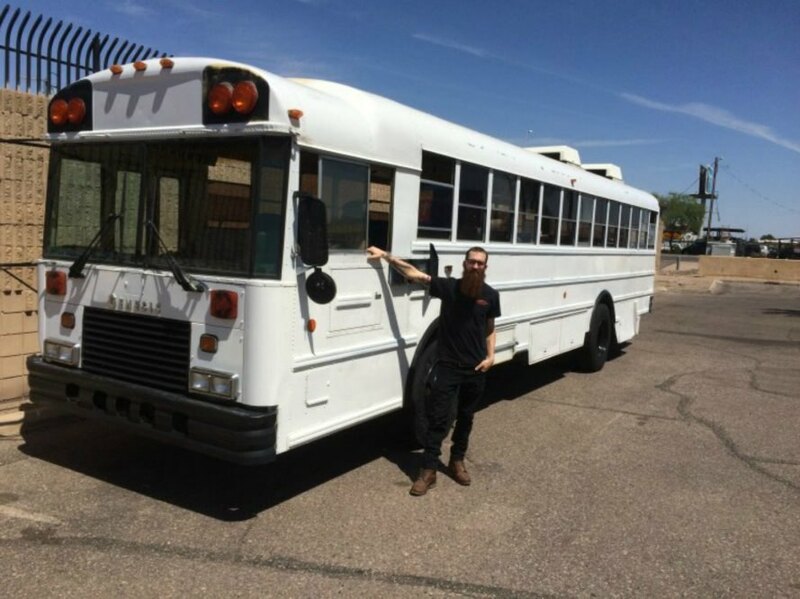 After deciding to take the leap into nomadic living from their Chicago home, the couple was able to purchase an old school bus for $4,000. They gutted the entire structure and began to do the bus renovations themselves, using as much repurposed materials as possible. The couple did the renovations themselves. A second bedroom is located just underneath on the bottom floor. Adjacent to the sofa is a dining table that can be folded down when not in use. A cast iron pot belly woodstove sits in the corner of the living space, and provides enough heat to warm the interior. The couple decided to leave their Chicago apartment to become permanent nomads. The bus conversion took almost two years. 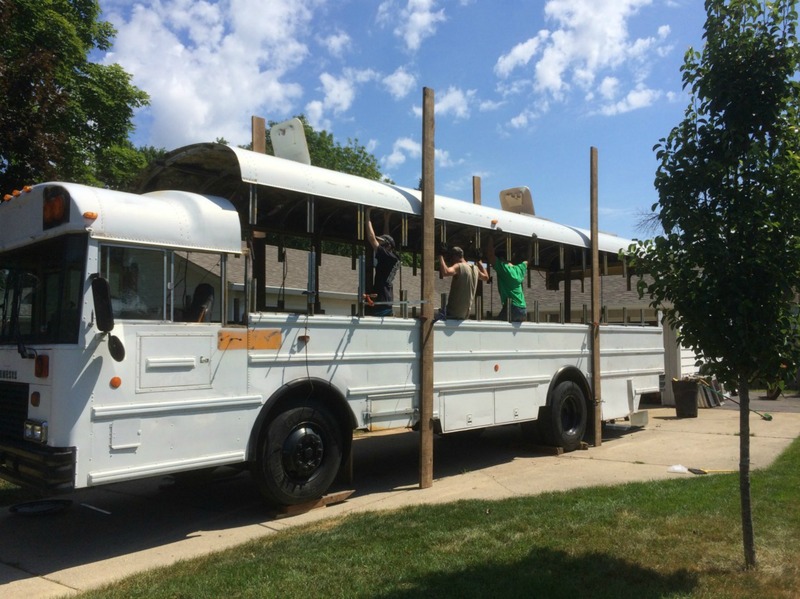 The couple did most of the structural work on the bus themselves. A year and a half later, the couple had raised the roof 24 inches to add height to the living space. The school bus is equipped with solar energy from panels on the roof. The extra space does wonders for the living area, which - thanks to the porthole skylights on the raised ceiling - is illuminated with an abundance of natural light. Tons of natural light illuminates the interior thanks to the skylights. The home's finishings are sophisticated and modern. Tons of windows add a light, airy feel to the interior. According to the handy duo, they wanted to make their new home as self-sufficient as possible. They used as many repurposed materials in the conversion process as possible including upcycled bamboo flooring, reclaimed barn beam countertops, reclaimed barn wood accent wall, and a locally-reclaimed walnut table. For energy use, a 900-watt solar array provides all of the family's energy and their water use is reduced thanks to the composting toilet, and a lowflow shower head in the bathroom.